What occurs the first Saturday each May at Churchill Downs in Louisville, Kentucky is not just a horse race. It’s the would famous Kentucky Derby and often described as the “most exciting two minutes in sports.” If you’re not lucky enough to be at Churchill Downs in person, then host a Kentucky Derby party in style. First run in 1875, this year marks the 141st edition of The Kentucky Derby. The popular event kicks off the horse racing circuit and is the first jewel of the Thoroughbred Horse Racing Triple Crown. The Derby isn’t only about horse racing. This incredible event is a unique blend of sports, fashion and style. Southern traditions are in full display. Roses are the official flower of the Kentucky Derby and G.H. 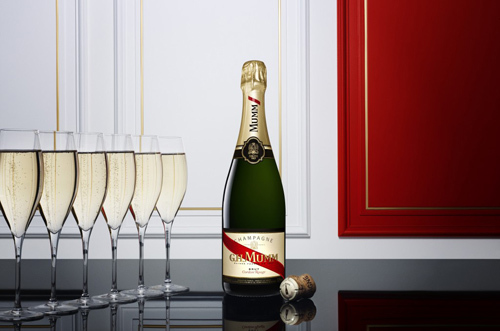 MUMM is proud to once again be the official champagne. Limor Suss is an Entertaining and Lifestyle Expert and has offered some wonderful tips to make your Kentucky Derby party a fun and successful one for all. She’s offered some derby games and even how to make derby hats from cheese! Suss suggests all party guest dress the role and come in their finest clothes. Women can war the derby traditional colorful sundresses and hats. Men should dress to impress by wearing light linen or seersucker suits. It’s not a time to be conservative. Consider eye popping colors like light blue, coral, yellow or even lime. As mentioned above, roses are the office race flower. Bring some Southern charm to your Kentucky Derby party by spreading red rose petals on your serving tables. – Pour all ingredients, except G.H. MUMM Cordon Rouge, into a mixing glass. – Add ice, cover and shake vigorously for 7-8 seconds. – Pour G.H. MUMM Cordon Rouge into a chilled cocktail-martini glass and pour the cocktail over it. Ladies will really enjoy participating in a hat decorating station. Purchase some fun items like flowers, butterflies, lace, tulle and even feathers. Place them on a table along with some inexpensive hats. Create your own custom hat with a a glue gun and your imagination. What fun! How about making a derby hat out of cheese? A Derby “Cheese Hat” can easily be made with several different sized rounds of brie cheese. Like a traditional wedding cake, stack the brie cheese or any other round cheese. You can add a colored ribbon or even some flowers and herbs. Serve your guests the cheese along with fig jam and toasted bread. Who doesn’t love dessert? Serve your Kentucky Derby party guests some derby inspired delicacies. Since the race is the first leg of the Triple Crown, serve three different desserts including Mini pecan pies, mint julep cupcakes and Bourbon bites. If you would actually like to attend this year’s coveted Kentucky Derby in person, contact us today. We can help make all your travel reservation plans and provide you a VIP experience. If you enjoy reading about how to host a Kentucky Derby party, return and follow our popular luxury blog.